Environmental degradation is one of the ten threats officially cautioned by the High-level Panel on Threats, Challenges and Change of the United Nations. The United Nations International Strategy for Disaster Reduction defines environmental degradation as "the reduction of the capacity of the environment to meet social and ecological objectives, and needs". Environmental degradation comes in many types. When natural habitats are destroyed or natural resources are depleted, the environment is degraded. Efforts to counteract this problem include environmental protection and environmental resources management. The current top three uses of fresh water account for 95% of its consumption; approximately 85% is used for irrigation of farmland, golf courses, and parks, 6% is used for domestic purposes such as indoor bathing uses and outdoor garden and lawn use, and 4% is used for industrial purposes such as processing, washing, and cooling in manufacturing centres. It is estimated that one in three people over the entire globe are already facing water shortages, almost one-fifth of the world population live in areas of physical water scarcity, and almost one quarter of the world's population live in a developing country that lacks the necessary infrastructure to use water from available rivers and aquifers. Water scarcity is an increasing problem due to many foreseen issues in the future including population growth, increased urbanization, higher standards of living, and climate change. Climate change affects the Earth's water supply in a large number of ways. It is predicted that the mean global temperature will rise in the coming years due to a number of forces affecting the climate. The amount of atmospheric carbon dioxide (CO2) will rise, and both of these will influence water resources; evaporation depends strongly on temperature and moisture availability which can ultimately affect the amount of water available to replenish groundwater supplies. Thermal expansion of water and increased melting of oceanic glaciers from an increase in temperature gives way to a rise in sea level. This can affect the fresh water supply to coastal areas as well. As river mouths and deltas with higher salinity get pushed further inland, an intrusion of saltwater results in an increase of salinity in reservoirs and aquifers. Sea-level rise may also consequently be caused by a depletion of groundwater, as climate change can affect the hydrologic cycle in a number of ways. Uneven distributions of increased temperatures and increased precipitation around the globe results in water surpluses and deficits, but a global decrease in groundwater suggests a rise in sea level, even after meltwater and thermal expansion were accounted for, which can provide a positive feedback to the problems sea-level rise causes to fresh-water supply. A rise in air temperature results in a rise in water temperature, which is also very significant in water degradation as the water would become more susceptible to bacterial growth. An increase in water temperature can also affect ecosystems greatly because of a species' sensitivity to temperature, and also by inducing changes in a body of water's self-purification system from decreased amounts of dissolved oxygen in the water due to rises in temperature. A rise in global temperatures is also predicted to correlate with an increase in global precipitation but because of increased runoff, floods, increased rates of soil erosion, and mass movement of land, a decline in water quality is probable, because while water will carry more nutrients it will also carry more contaminants. While most of the attention about climate change is directed towards global warming and greenhouse effect, some of the most severe effects of climate change are likely to be from changes in precipitation, evapotranspiration, runoff, and soil moisture. It is generally expected that, on average, global precipitation will increase, with some areas receiving increases and some decreases. Climate models show that while some regions should expect an increase in precipitation, such as in the tropics and higher latitudes, other areas are expected to see a decrease, such as in the subtropics. This will ultimately cause a latitudinal variation in water distribution. The areas receiving more precipitation are also expected to receive this increase during their winter and actually become drier during their summer, creating even more of a variation of precipitation distribution. Naturally, the distribution of precipitation across the planet is very uneven, causing constant variations in water availability in respective locations. Changes in precipitation affect the timing and magnitude of floods and droughts, shift runoff processes, and alter groundwater recharge rates. Vegetation patterns and growth rates will be directly affected by shifts in precipitation amount and distribution, which will in turn affect agriculture as well as natural ecosystems. Decreased precipitation will deprive areas of water causing water tables to fall and reservoirs of wetlands, rivers, and lakes to empty. In addition, a possible increase in evaporation and evapotranspiration will result, depending on the accompanied rise in temperature. Groundwater reserves will be depleted, and the remaining water has a greater chance of being of poor quality from saline or contaminants on the land surface. The human population on Earth is expanding rapidly which goes hand in hand with the degradation of the environment at large measures. Humanity's appetite for needs is disarranging the environment's natural equilibrium. Production industries are venting smoke and discharging chemicals that are polluting water resources. The smoke that is emitted into the atmosphere holds detrimental gases such as carbon monoxide and sulphur dioxide. The high levels of pollution in the atmosphere form layers that are eventually absorbed into the atmosphere. Organic compounds such as chlorofluorocarbons (CFC’s) have generated an unwanted opening in the ozone layer, which emits higher levels of ultraviolet radiation putting the globe at large threat. In areas with decreasing precipitation as predicted by the climate models, soil moisture may be substantially reduced. With this in mind, agriculture in most areas already needs irrigation, which depletes fresh water supplies both by the physical use of the water and the degradation agriculture causes to the water. Irrigation increases salt and nutrient content in areas that would not normally be affected, and damages streams and rivers from damming and removal of water. 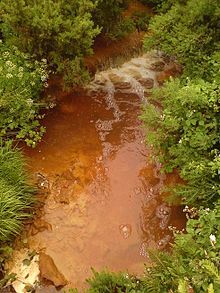 Fertilizer enters both human and livestock waste streams that eventually enter groundwater, while nitrogen, phosphorus, and other chemicals from fertilizer can acidify both soils and water. Certain agricultural demands may increase more than others with an increasingly wealthier global population, and meat is one commodity expected to double global food demand by 2050, which directly affects the global supply of fresh water. Cows need water to drink, more if the temperature is high and humidity is low, and more if the production system the cow is in is extensive, since finding food takes more effort. Water is needed in processing of the meat, and also in the production of feed for the livestock. Manure can contaminate bodies of freshwater, and slaughterhouses, depending on how well they are managed, contribute waste such as blood, fat, hair, and other bodily contents to supplies of fresh water. Water supply systems, as they exist now, were based on the assumptions of the current climate, and built to accommodate existing river flows and flood frequencies. Reservoirs are operated based on past hydrologic records, and irrigation systems on historical temperature, water availability, and crop water requirements; these may not be a reliable guide to the future. Re-examining engineering designs, operations, optimizations, and planning, as well as re-evaluating legal, technical, and economic approaches to manage water resources are very important for the future of water management in response to water degradation. Another approach is water privatization; despite its economic and cultural effects, service quality and overall quality of the water can be more easily controlled and distributed. Rationality and sustainability is appropriate, and requires limits to overexploitation and pollution and efforts in conservation. ^ Johnson, D.L., S.H. Ambrose, T.J. Bassett, M.L. Bowen, D.E. Crummey, J.S. Isaacson, D.N. Johnson, P. Lamb, M. Saul, and A.E. Winter-Nelson. 1997. Meanings of environmental terms. Journal of Environmental Quality 26: 581–589. ^ Huesemann, Michael H., and Joyce A. Huesemann (2011). Technofix: Why Technology Won’t Save Us or the Environment, Chapter 6, "Sustainability or Collapse? ", New Society Publishers, ISBN 0865717044. ^ "ISDR : Terminology". The International Strategy for Disaster Reduction. 2004-03-31. Retrieved 2010-06-09. ^ Warner, K.; Hamza, H.; Oliver-Smith, A.; Renaud, F.; Julca, A. (December 2010). "Climate change, environmental degradation and migration". Natural Hazards. 55 (3): 689–715. doi:10.1007/s11069-009-9419-7. ^ a b c d e f g h ”Water.” Climate Institute. Web. Retrieved 2011-11-03. ^ a b c d Young, Gordon J., James Dooge, and John C. Rodda. Global Water Resource Issues. Cambridge UP, 2004. ^ a b c Frederick, Kenneth D., and David C. Major. “Climate Change and Water Resources.” Climatic Change 37.1 (1997): p 7-23. ^ a b c d e f g Ragab, Ragab, and Christel Prudhomme. "Soil and Water: Climate Change and Water Resources Management in Arid and Semi-Arid Regions: Prospective Challenges for the 21st Century". Biosystems Engineering 81.1 (2002): p 3-34. ^ a b Konikow, Leonard F. "Contribution of Global Groundwater Depletion since 1990 to Sea-level Rise". Geophysical Research Letters 38.17 (2011). ^ a b Raleigh, Clionadh, and Henrik Urdal. “Climate Change, Environmental Degradation, and Armed Conflict.” Political Geography 26.6 (2007): 674–94. ^ a b c MacDonald, Glen M. "Water, Climate Change, and Sustainability in the Southwest". PNAS 107.50 (2010): p 56-62. ^ a b Tilman, David, Joseph Fargione, Brian Wolff, Carla D'Antonio, Andrew Dobson, Robert Howarth, David Scindler, William Schlesinger, Danielle Simberloff, and Deborah Swackhamer. "Forecasting Agriculturally Driven Global Environmental Change". Science 292.5515 (2011): p 281-84. ^ Wallach, Bret. Understanding the Cultural Landscape. New York; Guilford, 2005. ^ . Powell, Fannetta. "Environmental Degradation and Human Disease". Lecture. SlideBoom. 2009. Web. Retrieved 2011-11-14. ^ "Environmental Implications of the Global Demand for Red Meat". Web. Retrieved 2011-11-14. ^ Wang, George C. (April 9, 2017). "Go vegan, save the planet". CNN. Retrieved April 16, 2017.